PowerViewerPlus can control a PX8000 and acquire raw waveform data from the PX8000 via Ethernet, USB or GP-IB and calculate numeric, harmonic data and waveform parameters. 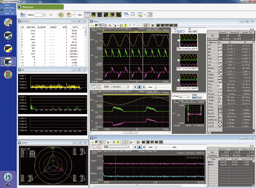 It lets you view waveforms on your PC, converts waveform data to a csv format for data calculation and stores those data. It can handle max. 100M points/CH waveform data. With the trial version of the software, all functions included in the retail edition of the PowerViewerPlus are available to you for 30 days after installation. Download the file below in zip format. Execute PowerViewerPlus_Installer.exe to start the installation.